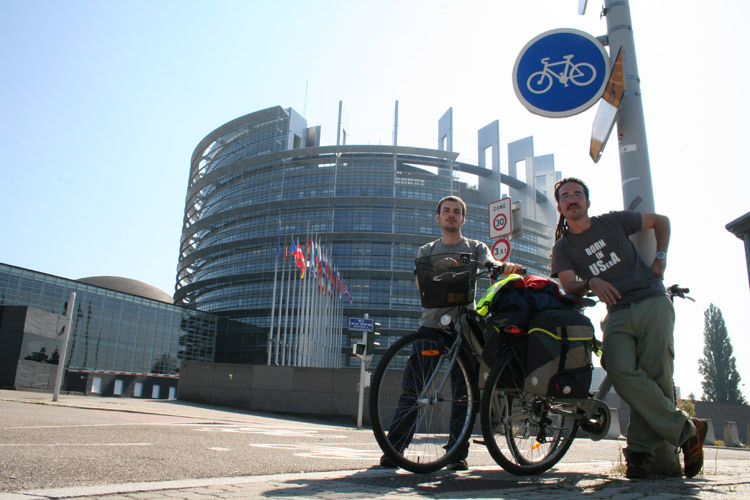 Europe by bike proposes various routes by which the frontiers of the European Union can be explored. We want to recommend and popularise cycling- this ecologically friendly mode of transport- as an ideal way to visit regions and to experience them thoroughly. By travelling by bike, it is possible to cover a significant amount of kilometres per day in a relaxed manner. One can stop when one wishes, enjoy the scents and sounds of the surrounding environment, while visiting suggested locations as outlined on the itinerary. Our objective is to provide as much useful information as possible, enabling you to tailor the journey according to your own needs and interests. On the home page you will see a map of Europe with the travel routes highlighted in red. Click on one of these to access information relating to the respective trip. Included are photos, useful information about places worth seeing, as well as helpful links relating to accommodation, camping, maps, and tourist attractions. 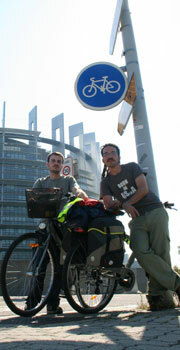 Europebybike was created with the desire to promote the use of the bicycle as a means for travelling. It has been made possible thanks to the support of the Youth Programme of the European Commission. The proposed routes have a particular quality insofar as they set out to highlight pertinent cultural and historical aspects of each visited region. We also try to emphasis the significance of interaction with native persons in each place, and cycling facilitates this type of meeting. With the development of the European Union, boundaries between countries have come to assume a symbolic, rather than practical, significance. The end of the frontiers has supposed also the end of the wars in Occidental Europe. International exchange has become far more fluid, allowing for a greater sense of cooperation, conviviality and tolerance between people from different backgrounds. Today, crossing between boundaries within the European Union involves no major bureaucratic difficulty. We believe that Europeans have an advantage in this regard, and anticipate a time when other regions around the world should follow suit. As creators of this website, we seek to combine our expertise in the realms of communication, photography and design in service of the enterprise of travel and tourism. In turn, it is hoped, this project will engender a sense of openness toward alternative cultures, as well as awareness with regard to outstanding ecological issues. Our project does not end here. Moreover, it has just begun. Europebybike is a live project, open to suggestion and collaboration. We await your mails proposing new routes, sending us your pictures, and details of your travel experiences so that we can add them to the site!